A movie that starts off with promise and then just gets worse and worse as it goes on, making every mistake imaginable. This is a movie about a bad time in the economy and a bunch of guys that get laid off. 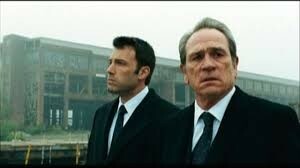 The three men at the center of the movie are Ben Affleck, (Bobby), Tommy Lee Jones (Gene), and Chris Cooper (Phil). They all work for the same company and are friends or friendly with each other, and each one of them is of a very different status with the company. None of that matters when it comes to the firings. Not even the guy who is the best friend of the owner of the company is safe. The movie works in the first half, where we get to know the situation and characters, but then it leaves itself nowhere to go after that. A film needs more than a strong premise to hold our attention. There have been better movies made about this same subject matter (such as Up In The Air), which work because they have new and creative angles to offer the movie, which have not been seen in other places before. The Company Men have none of that. It is a very routine movie, and even the qualities that have been setup to work end up not getting handled correctly in the second half.This is a movie about a bad time in the economy and a bunch of guys that get laid off. The three men at the center of the movie are Ben Affleck, (Bobby), Tommy Lee Jones (Gene), and Chris Cooper (Phil). They all work for the same company and are friends or friendly with each other, and each one of them is of a very different status with the company. None of that matters when it comes to the firings. Not even the guy who is the best friend of the owner of the company is safe. The movie works in the first half, where we get to know the situation and characters, but then it leaves itself nowhere to go after that. A film needs more than a strong premise to hold our attention. There have been better movies made about this same subject matter (such as Up In The Air), which work because they have new and creative angles to offer the movie, which have not been seen in other places before. The Company Men have none of that. It is a very routine movie, and even the qualities that have been setup to work end up not getting handled correctly in the second half. 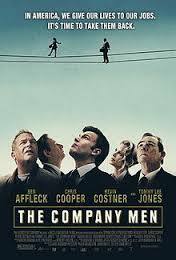 The Company Men are a movie with a somewhat interesting premise that just doesn’t have anywhere to go with it. This is a movie about getting laid off. It’s Up In The Air meets margin call, but that’s just in regards to the subject matter. In regards to how the movie is actually handled and turns out, it is more like margin call meets too big to fail, which is to say that it is boring as hell. That’s a real shame considering that the first half or so was actually quite good. After that, however, the movie just plummeted straight to the ground. A movie about a tough time in the economy and a bunch of people getting fired can be very interesting. Up In The Air took that premise and ran with it, giving us when of the best movies of that year. That’s because it didn’t just set itself in a time frame and situation and expect the whole movie to work because they established a good setting. Instead, that movie had plenty of ideas to throw on our path as we watched it. There was Clooney’s fight against technology and the way the new firing system was depersonalizing everything. There was his romantic affair turned conflict with Vera Farmiga. There was even Anna Kendrick and her relationship story, as well as a whole subplot about him getting his name on a plane and achieving a monumental flight status. All of those kind of details are absent from The Company Men. Up In The Air were both a drama and a comedy at the same time. It had energy that came from unexpected places. The Company Men, on the other hand, is pure depressing drama. Now that’s okay, considering the subject matter, but the problem is that the movie doesn’t have anything new to offer. Whatever areas of interest there are in this film are not handled correctly, and so it boils down to a series of missed opportunities. The story is about two main characters. Bobby Walker (Ben Affleck) and Gene McCarty (Tommy lee Jones.) These guys are both standout employees at a ship building company known as GTX. Walker, in particular, is the main star of the film, and he has a wife, two children, a huge house, and a Porsche. He comes into work late, walking right into a meeting, bragging about how he just got off the golf course and how he played. This guy is definitely a jerk at the start of the film. He gets what’s coming to him, as the people in the room try to talk and he won’t shut up about his golf game. Finally when he gives them a second to speak, they tell him to go see a higher up for a meeting. That meeting is where bobby gets fired. It’s Sally Wilcox (Maria Bello), who does the laying off, and apparently a senior partner assured bobby that his job was safe just recently. Bobby goes through the building looking for that partner, who surely wouldn’t let this be happening to him, only that partner is nowhere to be found. He is conveniently away in another city at this time. Bobby goes home to tell his wife the bad news. Before he can get of the door to leave his office, however, a number of other people come to see him to ask if he knows if they are getting fired as well. Nice sympathy. There are actually two other main characters, aside from Bobby. There’s Tommy Lee Jones, of course, playing Gene, a higher up with the company, and then there’s Phil, played by Chris Cooper, as a middleman. When bobby gets fired, Phil comes to see him in his office to talk about it. The next day, Gene meets bobby for lunch to discuss how Gene can help him. I really like that all three of these characters know each other and are part of the same story. From the trailers for this movie, it always seemed like these were three different stories about men in similar situations. At least with one story, there’s the chance that it can go deep and be interesting. No such luck here. Gene has the situation that should be the most fascinating one in the movie. He is a best friend with the guy in charge of the company. Gene is a very high level public figure for the company, making speeches on their behalf at shareholder dinners (even if what he says ends up being very unpopular.) the owner of the company is jams Salinger (Craig T. Nelson), and he is the man behind all of these firings. The first interaction we get between he and Gene has Gene walking into a meeting and going off on Salinger for dismantling one of his divisions behind his back. Gene shouts that it was his division and Salinger retorts back that it’s his company. What makes their relationship so interesting is that we learn these two guys have some real history together. They pretty much started the company together with Salinger running the ship and Gene as his second in command. These guys were college roommates and Salinger was the best man at Gene’s wedding. None of that matters when it comes to money, however, and it isn’t long before both Phil (Cooper), and Gene are fired as well. This is where the movie falters. Not in the firings of these two men, but in the ways that these firings are handled. I like that all three men aren’t laid off at the same time, and so even though bobby is gone, we get to see the inner-workings of the company through the guys who are still there (Gene and Phil), but then in one fell swoop both Gene and Phil are fired and that really leaves us nowhere to go. On top of that, Gene never confronts his former best friend, Salinger, about firing him. It is a huge missed opportunity. Another one comes when a character dies and instead of cashing in on that to give us some real drama, the movie kind of rushes right over it quickly. And then there’s the story of bobby, which just gets more and more boring as it goes on. This guy goes to work for an outreach program, which is basically a place that provides him a desk and a phone to call other companies and setup interviews. Bobby goes to work for his wife’s brother, played by a wasted Kevin Costner, and nothing comes of that situation either. Even the positive ending to this whole mess feels very forced and unnatural. The movie needed to give us more. The setups were all there, (for example, I love the relationship between Gene and Salinger), but there was just no follow through. How do you build up to something great and then never let that great thing happen? The second half of this movie actually becomes painful to watch with how lifeless it becomes. What a shame, because in the first portions of the film, this thing really seemed to have some potential.